Opera Password Recovery is a simple yet powerful password recovery tool, designed to recover logins and passwords cached by Opera browser, as well as passwords to all mail accounts configured in Opera Mail. Simply run this program, click on the "Start Recovery" button, all your Opera saved passwords will be decrypted and recovered instantly! 100% satisfaction guaranteed! Export cached passwords from the Opera Wand password manager. Support all versions of Opera Mail and Opera web browser: Opera 7 - 12. Since Opera Next 15 Beta, it moved to use the WebKit engine like Chrome does. If you want to recover saved website passwords from Opera 15 or higher, please switch to use Password Recovery Bundle which allows you to recover Chrome password. Recover forgotten website passwords stored by Opera browser, as well as passwords to all mail accounts configured in Opera Mail. Opera has a handy password manager feature - The Wand. The only problem with Opera Wand Password Manager is that it doesn't have any way to view or export the saved passwords. What if your browser crash and you are left with so many lost passwords you can not remember? How to backup your saved passwords if you want to re-install computer? There are many other situations you need Opera Password Recovery program. You want to uninstall Opera but there are several passwords that is stored in it but you don't remember. Opera constantly crashes every time you open it. You need to recover all the saved logins and passwords from Opera. There are a lot of passwords (email password, twitter password, forum passwords, etc.) stored by Opera browser and you would like to recover and backup them in case of computer crash or system upgrade. You have been using Opera Mail to connect to GMAIL for quite some time. So long in fact, you have forgotten what your password is. You can still use your email since Opera Mail automatically logs in, but you can't login to gmail account from gmail.com website because you can't remember password. "I use Opera for mail, browsing, FTP, home network upkeep and other things. I know Opera saves all my passwords in a wand.dat file, but it doesn't offer a way to allow me to see my saved passwords. Opera Password Recovery is the most wonderful and closest to being what I need. I would highly recommend this program for everyone, it will save you lots of frustrations in case your password is lost or forgotten!" "I want to uninstall Opera but there are several passwords that is stored in it but I don't remember. Opera Password Recovery really works for my purpose! Thanks a lot!" "Just a quick mail to tell you that I was successful in recovering AutoComplete passwords from Opera." 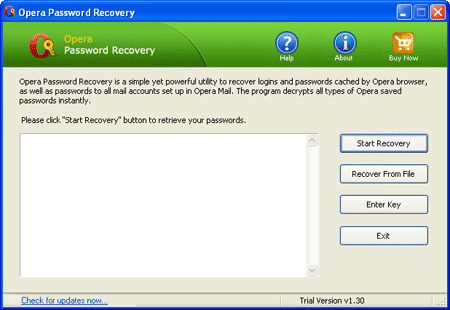 Learn How can you recover Opera saved passwords easily with Opera Password Recovery.